The discovery of Go Set A Watchman is the stuff of literary legend. Famous and reclusive author Harper Lee, whose only other published novel is the iconic classic, To Kill A Mockingbird, had written another book with the same cast of characters, set twenty years later. Finished in 1957, Lee’s editor at the time saw the spark and talent of the author but did not think that Watchman was ready for publication. The editor thought the strongest part of the novel were the flashbacks (I agree!) and urged Lee to use the passages as a basis for a new novel. Hence, To Kill A Mockingbird was born. The manuscript of Watchman was found in a safety deposit box in Lee’s hometown by her lawyer in 2014. The discovery of the manuscript was BIG literary news, and the publisher scheduled it for release this summer. Now, the circumstances surrounding the discovery of the manuscript and its publication are shady at best (you can read plenty about it the controversy here, here, and here) and I was faced with a moral conundrum as to whether I should buy and read the novel. I’m still not convinced that releasing the book was in Ms. Lee’s best interest or if she even had the capacity to consent to its publication. I decided to go for it, because at the end of the day, it’s Harper Lee and I’d read her shopping lists if I could. The novel opens with Jean Louise (Scout) who is all grown up – twenty six years old and living in New York. She’s coming back to Maycomb for two weeks to visit her family. Atticus is still practicing law but he’s getting up in age and has health issues (sniff) and Jem has died a few years back (super sniff). Other characters from Mockingbird are also present and play more prominent roles, including Calpurnia, Uncle Jack, and Aunt Alexandra. While certain perspectives and belief systems may have changed, the characters are still themselves – Jean Louise is feisty as ever and Atticus is still completely Atticus – serving as the “watchman,” or moral compass, of Maycomb. While home, Jean Louise stumbles upon some disturbing news that shatters her idea of her father as the authority on morality. Atticus, Jean Louise’s infallible moral crusader for race, the disenfranchised, and all things good in the world, is not as saintly as we once thought. We learn that even heroes can fall. I walked away from the book thinking that it is more about growing up – dealing with disillusionment about family, mentors, and idols, instead of race relations (although race serves as an undercurrent for these issues). There are many conversations between Jean Louise and various family members about race, segregation, and state rights, which were pertinent topics of the time. These conversations, however, are long-winded and confusing, and are slow to advance the plot. Which is to say, Watchman lacks the magic of Mockingbird. I knew this was coming, and it’s what I expected, but it’s still sad to write. If I wanted to read about people debating about race and segregation, I’d have read some historical text from the 1950’s, not this novel. The book also suffers from weak, clichéd dialogue, a slow-moving plot, unnecessary scenes, and poor character development. It reads like a draft and misses the mark in many places where Mockingbird excelled. If this were the only thing Ms. Lee had ever written, we would not know her name and probably would have never read her work. It should have stayed in the safety deposit box (sorry! sorry!). In her NY Times review, Michiko Kakutani writes that Go Set A Watchman can be read as a study – how did this novel evolve into the iconic Mockingbird? How did a lumpy tale about a young woman’s grief over her discovery of her father’s bigoted views evolve into a classic coming-of-age story about two children and their devoted widower father? How did a distressing narrative filled with characters spouting hate speech (from the casually patronizing to the disgustingly grotesque — and presumably meant to capture the extreme prejudice that could exist in small towns in the Deep South in the 1950s) mutate into a redemptive novel associated with the civil rights movement, hailed, in the words of the former civil rights activist and congressman Andrew Young, for giving us “a sense of emerging humanism and decency”? I know that this novel has polarized critics and especially readers. For the readers that did like it (it has 4/5 stars on Amazon right now), I’m not sure if the love for Mockingbird overflowed and allowed for more forgiveness and leeway for Go Set A Watchman. Standing on its own, it’s not a strong novel, and reading Atticus’s changed views is both jarring and disturbing. 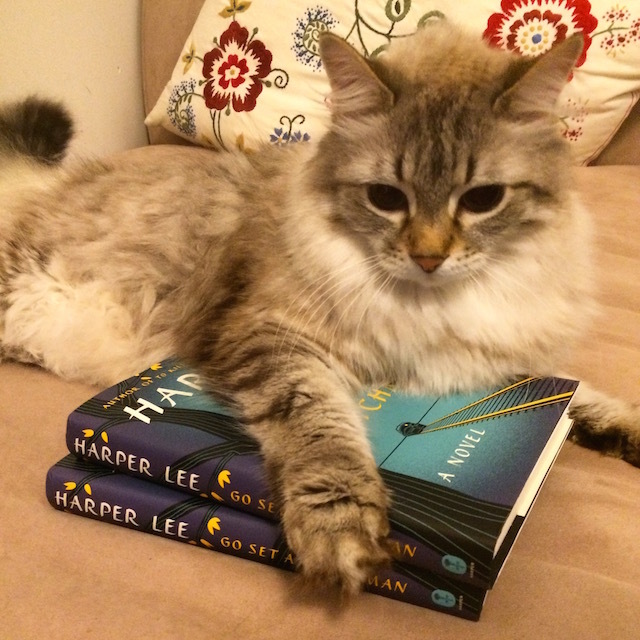 Lovers of Harper Lee may want to give it a try but it’s a book best left in the vault.